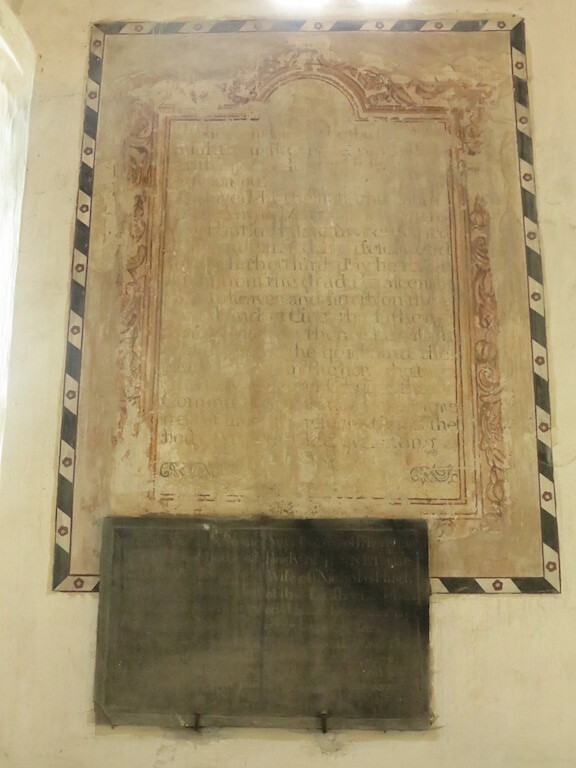 The main purpose of our visit to Llanfair-ar-y-bryn was to check the memorial to the great Welsh hymn-writer William Williams Pantycelyn and his family (see https://welshtombs.wordpress.com/ ) but there was a lot else of interest in and around the church. 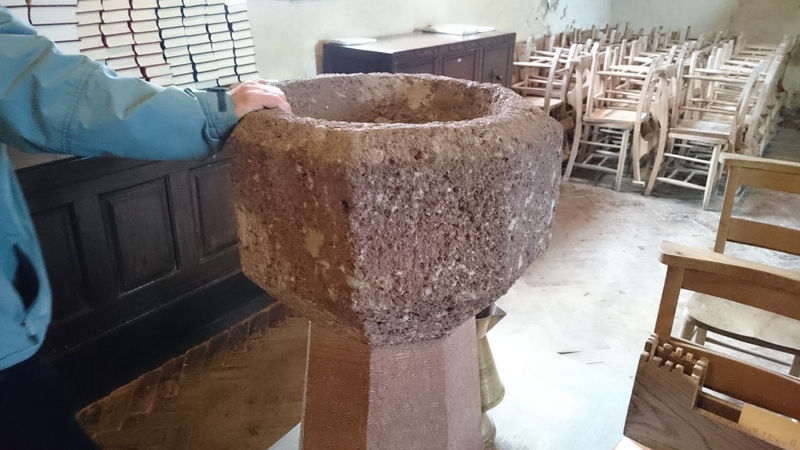 It stands on the site of a Roman auxiliary fort, and there is Roman tile and brick in the church walls. 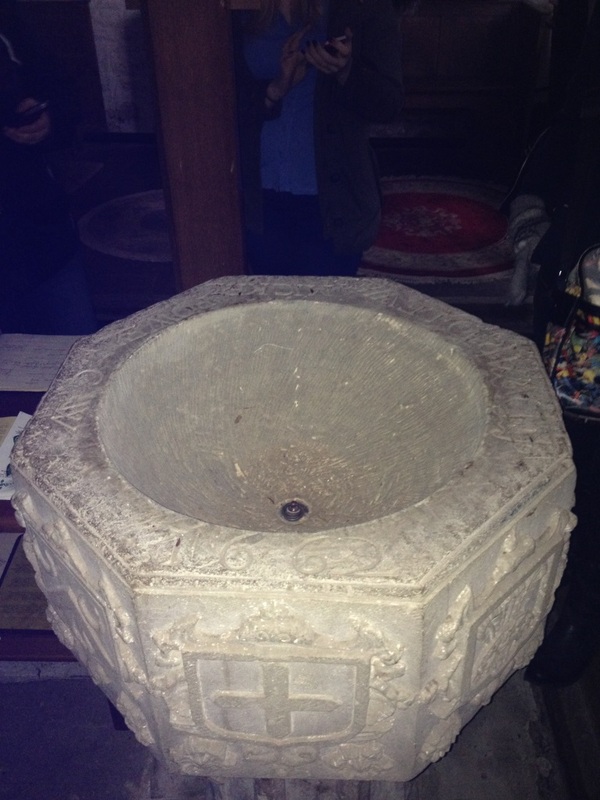 The church was deliberately damaged by fire. 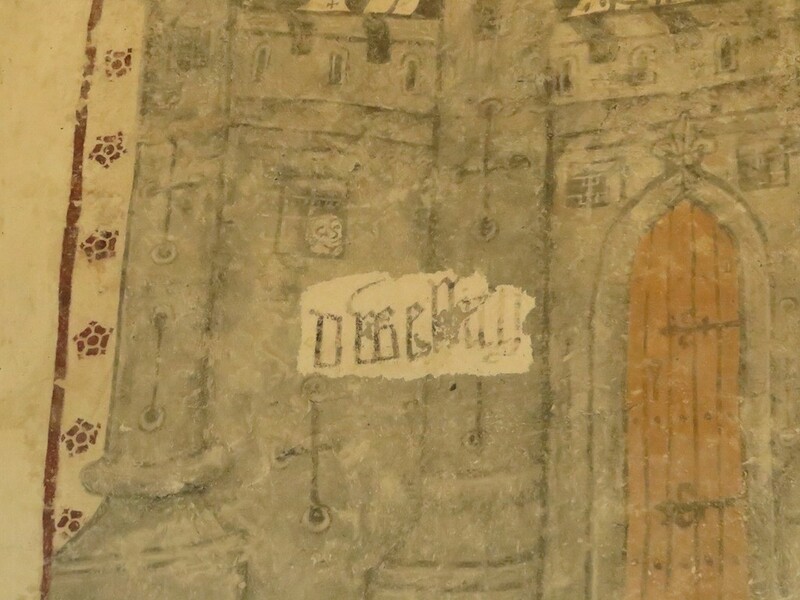 It was rebuilt by Sir John Giffard when he was constable of Llandovery castle. 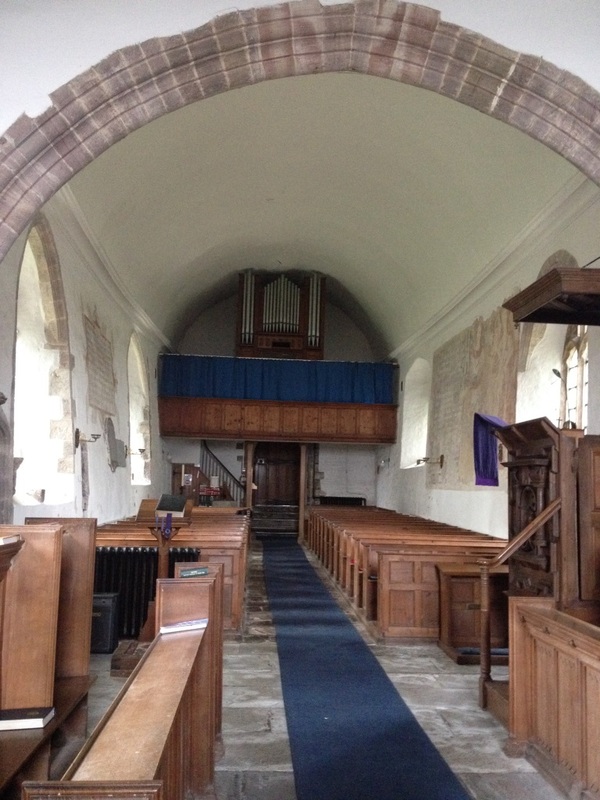 There were later alterations – the installation of a rood screen, some new windows. 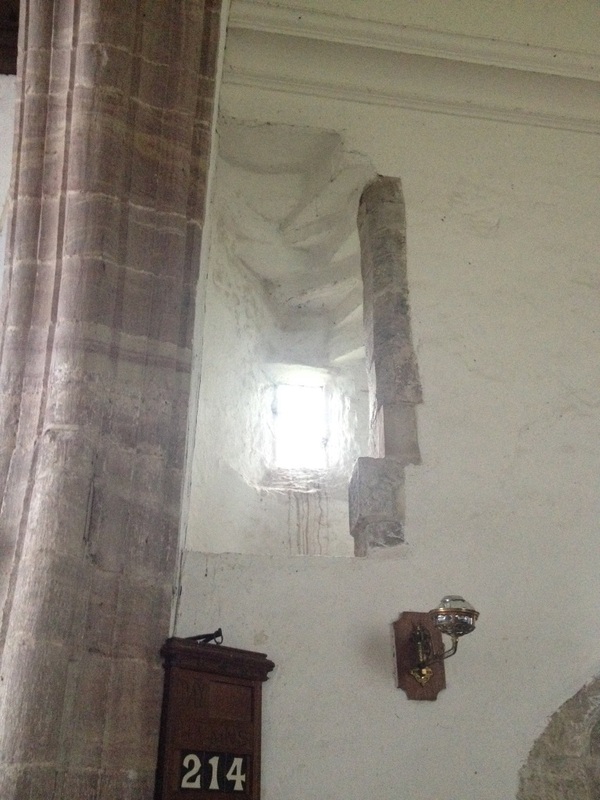 The floor of the original church sloped down hill to the east, but at some point the chancel floor was raised, leaving two rather odd windows low in the east wall. The church as it stands is big enough, but it was even bigger at one time. 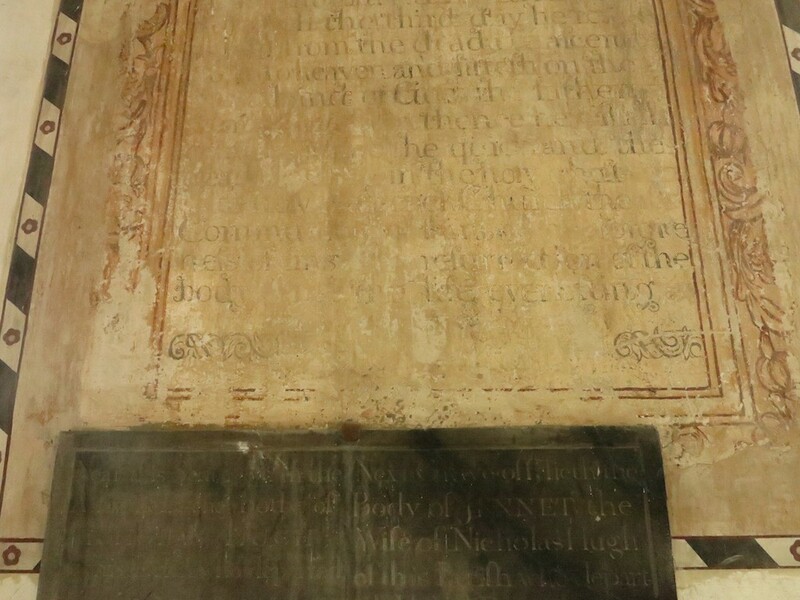 There was a south transept, but it was in ruins by the eighteenth century and used as a dumping ground for skulls and bones from the graveyard. 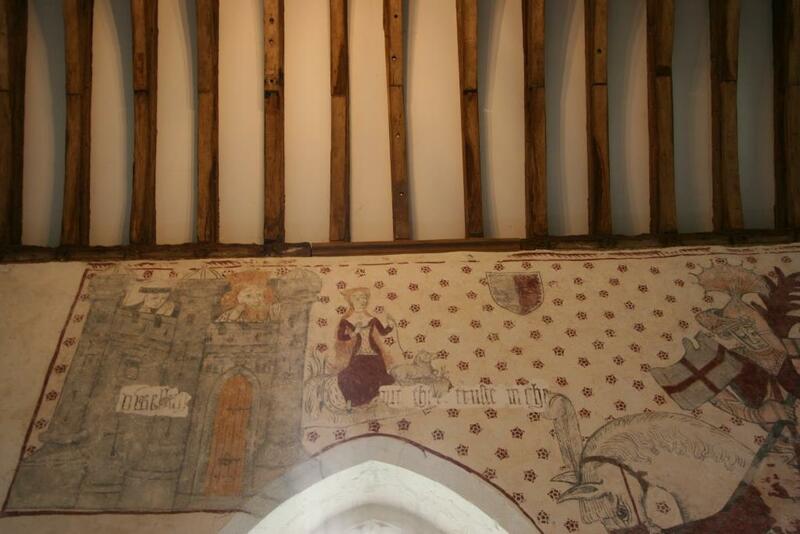 There may also have been a north transept. 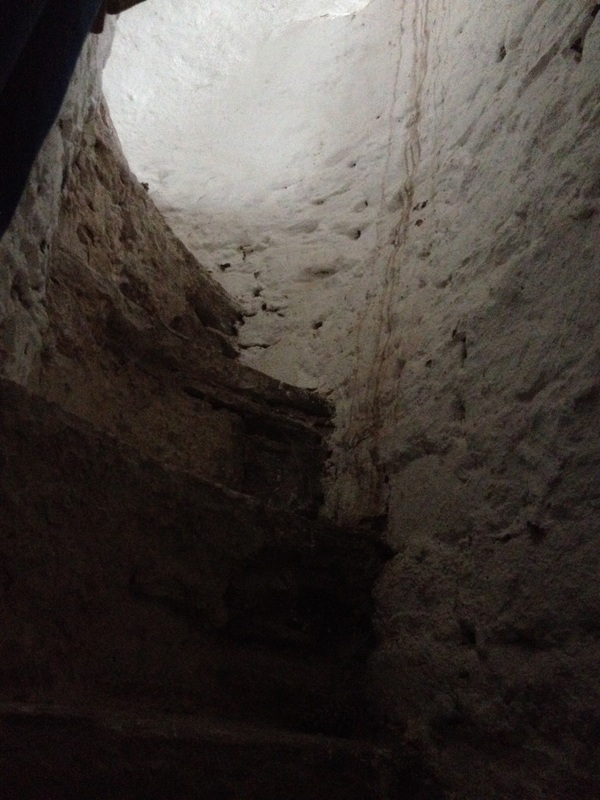 Inside, on the north wall, is this medieval cross slab. 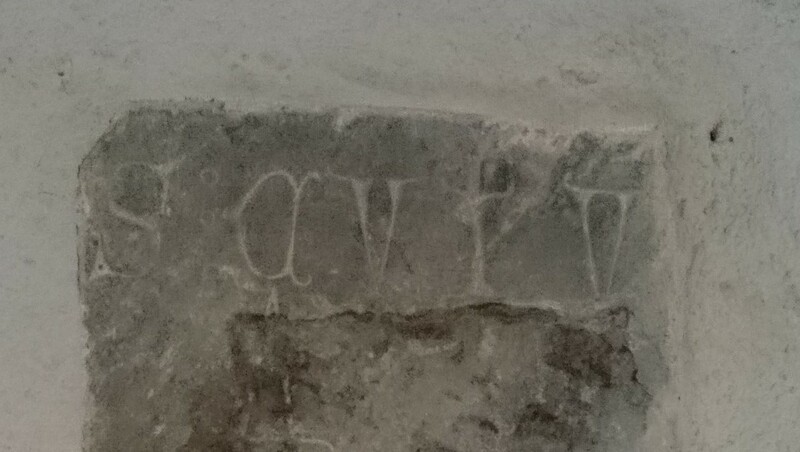 and the inscription reads …S: CVIV… (in other words, …s, cuiu[s anime deus propitietur], on whose soul may God have mercy). – could this possibly come from an effigy? 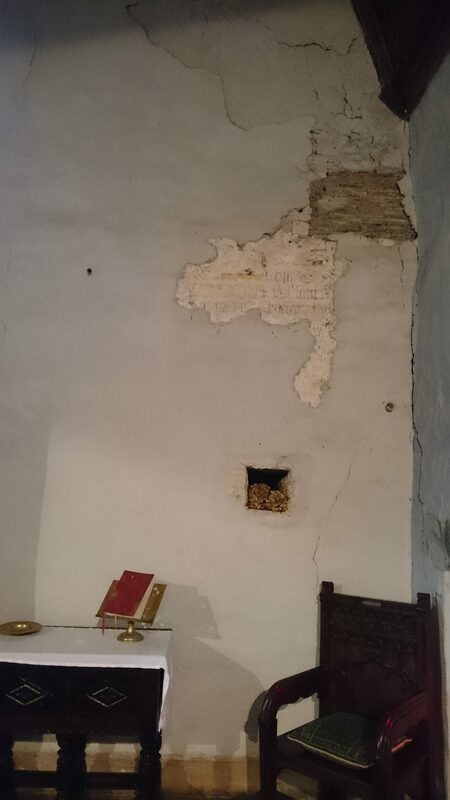 There are two sepulchral niches in the north wall of the chancel, one part obscured by subsequent rebuilding. 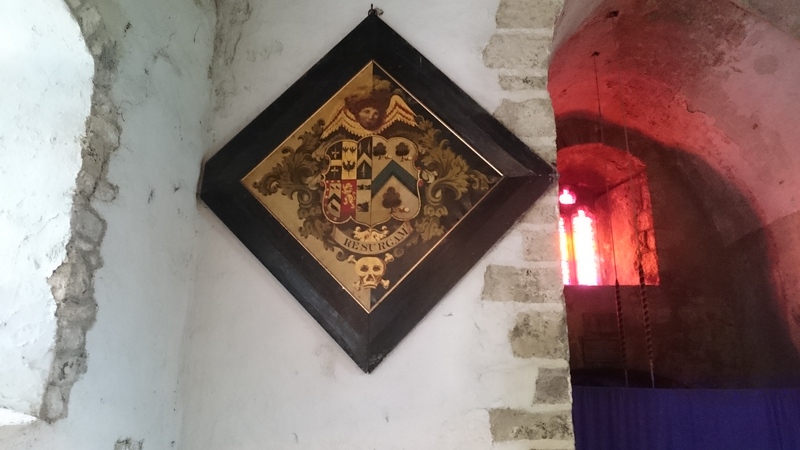 and some rather splendid hatchments of the local Gwynne family. And the King’s Head in Llandovery does a full vegan menu including some vegan chocolate brownies. 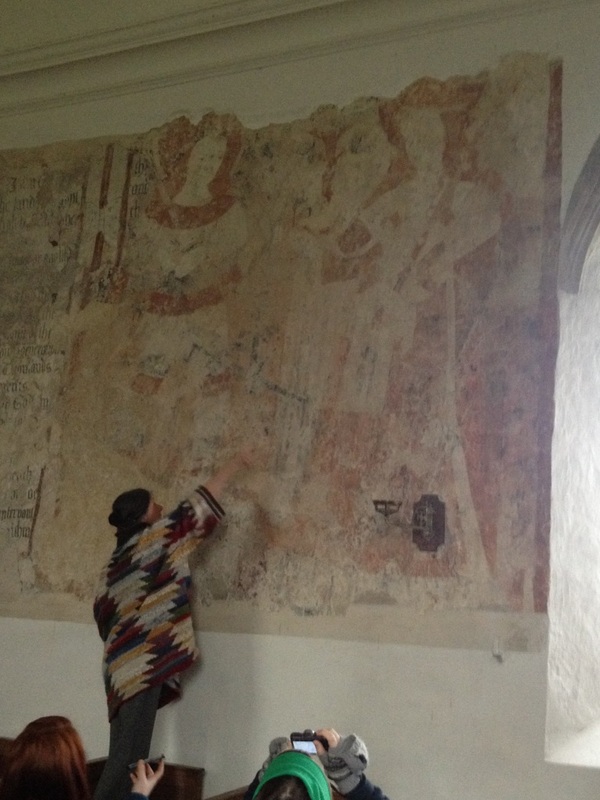 We are still having fun with the wall paintings at Llancarfan. 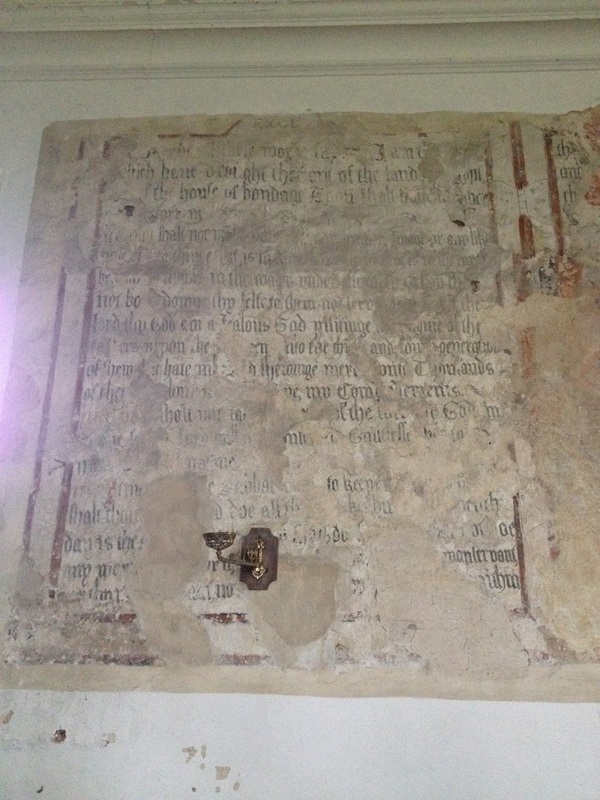 The most recent phase of conservation work has revealed (what we suspected would be there), facing the Seven Deadly Sins, the Seven Corporal Acts of Mercy. The last two, Visiting the Sick and Burying the Dead, are in superb condition with a wealth of intriguing detail. Clothing the Naked is less well preserved and the others may have been lost under George Pace’s little lean-to vestry. 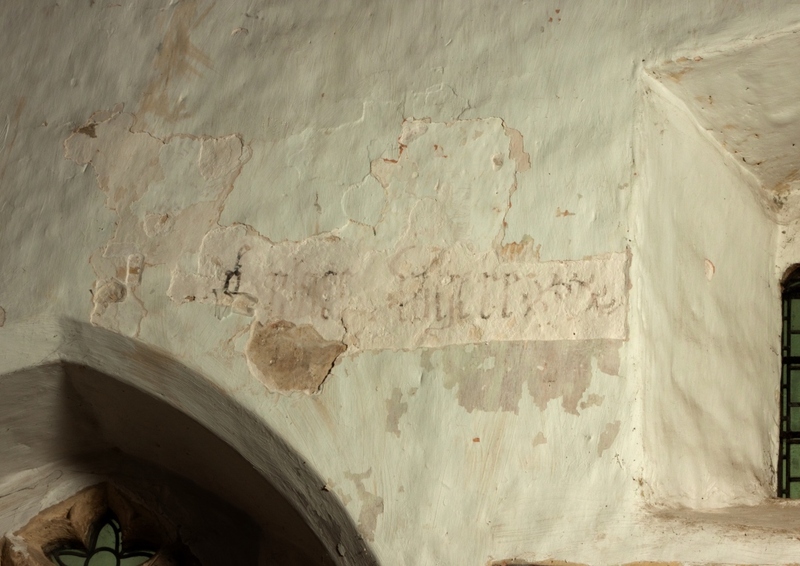 Recent conservation has also revealed some more blackletter texts on east, south and west walls. 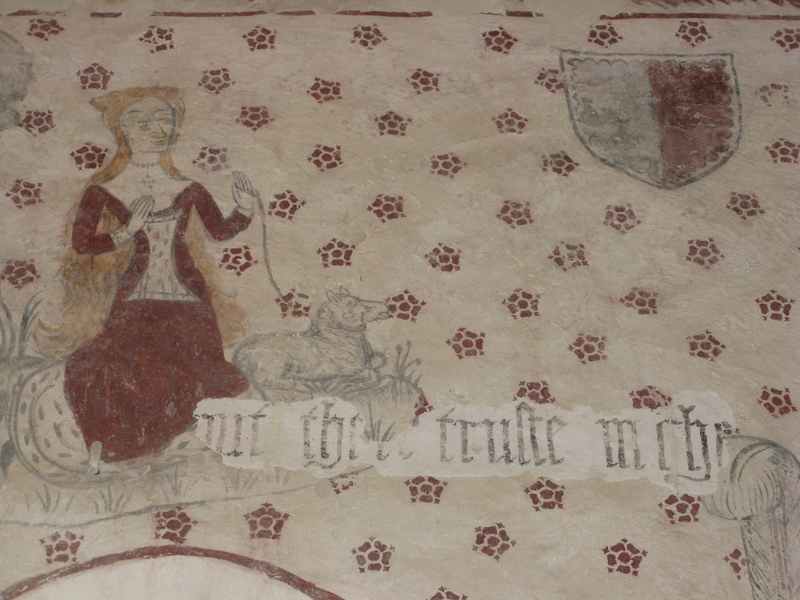 We already had some blackletter text overlying the painting of George and the Dragon – here in George Ferzoco’s photos. I have puzzled over this ever since it was revealed at the beginning of the project. Something including the words ‘dwelleth’ then ‘put thy truste in Christ’ – or perhaps ‘put their truste’ – but it rang no bells. This looked like ‘the place where …’. I got quite excited at the possibility of a Nativity narrative – the star that led the Wise Men and ‘went ahead of them until it stopped above the place where the child lay’. 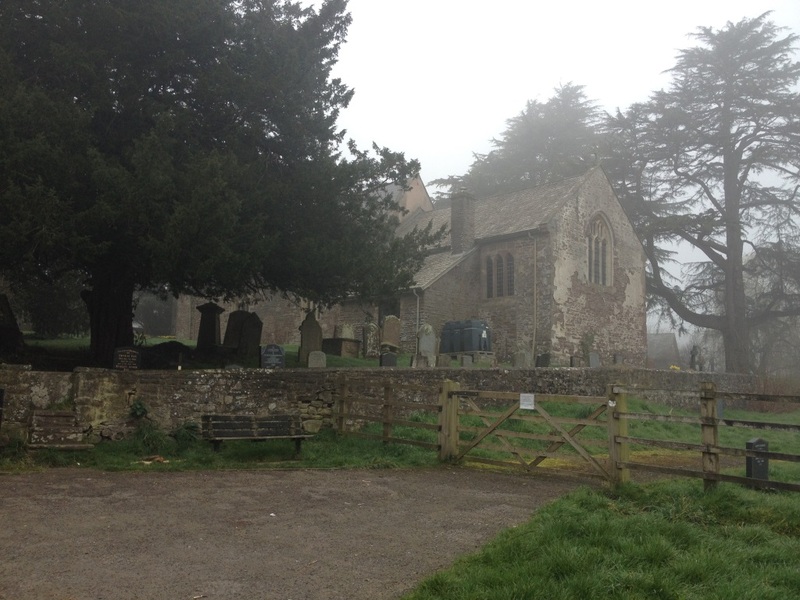 But then I realised it was much more likely that it came from Psalm 26 – ‘Lord, I have loved the habitation of thy house, and the place where thine honour dwelleth’. Much more suitable for a church. So the word ‘dwelleth’ came at the end of the text and we needed to look for something different for what followed. Somehow I had got it fixed in my head that we were looking at something about putting our trust in Christ. 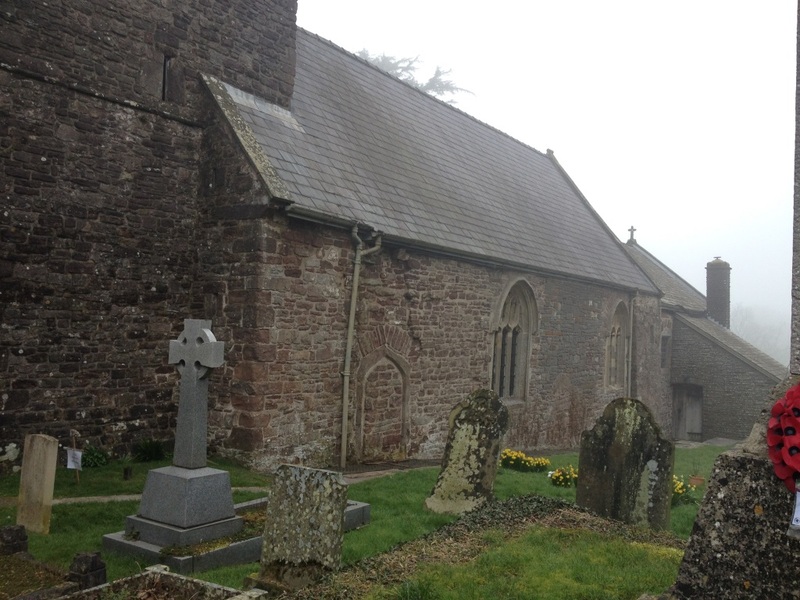 But on Tuesday I went back to Llancarfan to pre-walk the May Day walk route with Ian Fell (more on that anon). We had a lovely walk in the sunshine, stopped for a drink at the Bells in Penmark and met the Cowbridge Ecumenical Cycling Club. Mostly retired men from all the churches and chapels around Cowbridge, they get together for a gentle ride in the country and lunch in a pub somewhere. All very civilised. 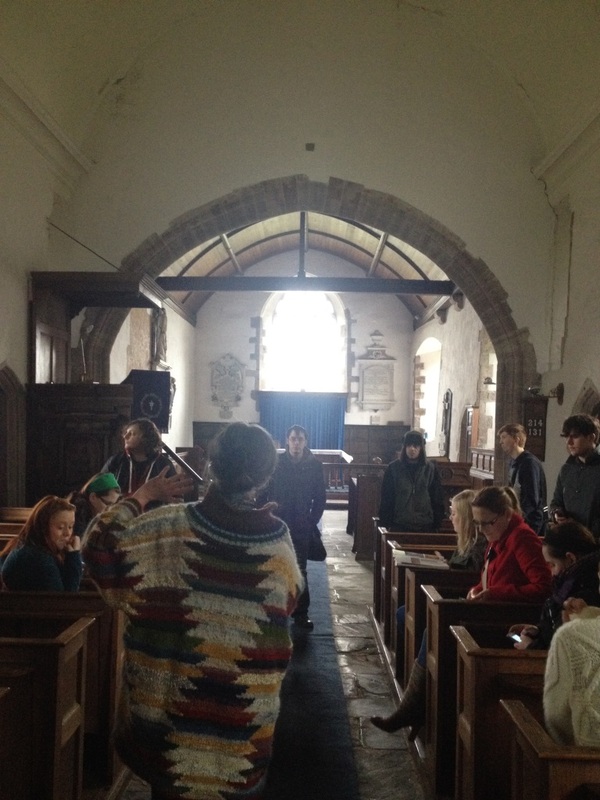 We popped into the church on the way back. I started to wonder if the ‘Ch…’ could be something else. So does the use of the BCP version of the psalm rather than the King James version suggest that we are looking at something late 16th century? Canon Belcher has another suggestion. He thinks the whole thing may have been part of a process of rededication of the church after the damage caused during the Civil War, when one of the windows was battered down by a farmer named Bush, crying ‘Down with the great whore of Babylon’. Ian has yet another suggestion. The bit about not putting your trust in horses would have overlain the huge equestrian figure of St George. 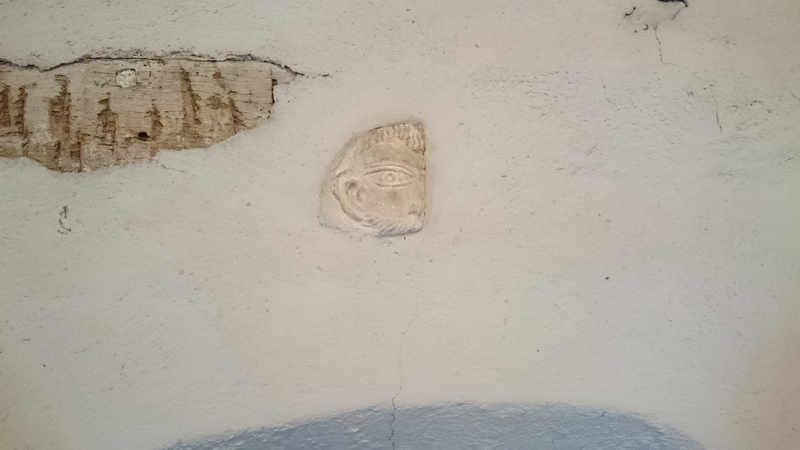 Was this done within the lifetime of those who would remember the wall painting of the saint – and was it a deliberate dig at the cult of the saints? All this suggests that we might need to look at the Book of Common Prayer for sources for the other post-Reformation texts. 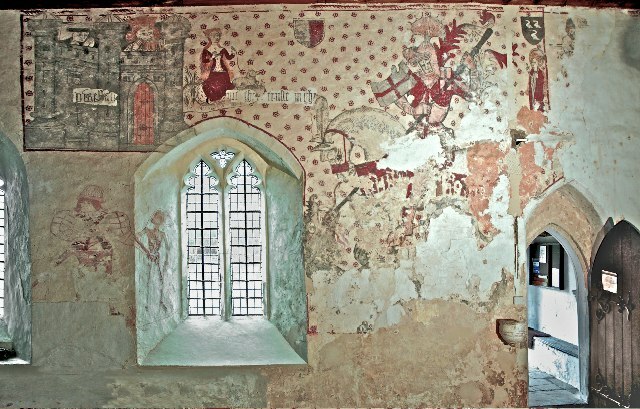 There are fragments on the east and west walls of the south aisle. So far I can’t make anything of them, but little by little we are getting there. 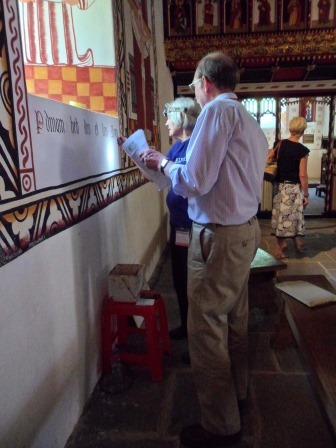 Another lovely afternoon, this time at the National History Museum in St Fagan’s watching the conservators paint the texts under the re-created wall paintings. Their experience must be something like that of the original painters: they are painting texts mainly in Latin, in black-letter script. It’s not so much writing as paintings of words. There are decisions to be made about abbreviation marks, and occasional mistakes. The dynamic must be very similar to that in a medieval parish when texts had to be chosen and written out, then painted and (presumably) checked by the priest. 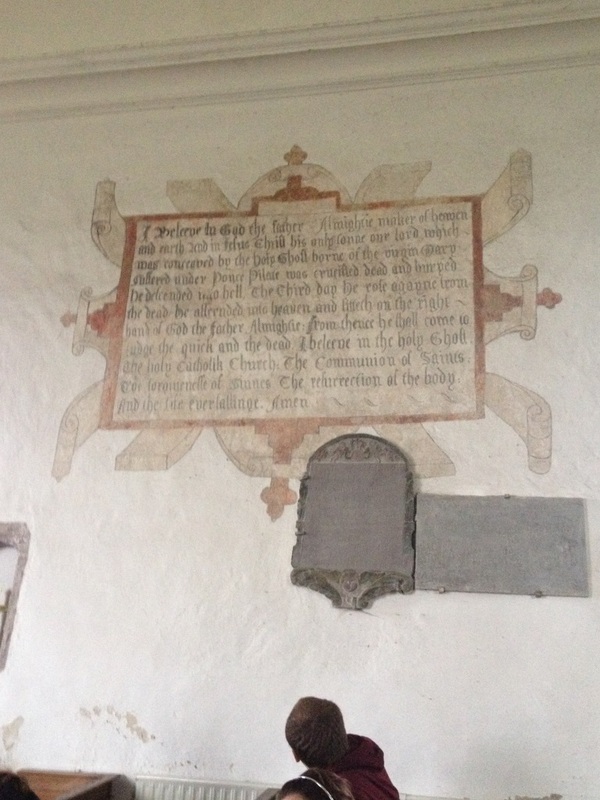 This whole business of text in wall paintings is very odd. We were surprised by the amount of writing we found on the walls of St Teilo’s. 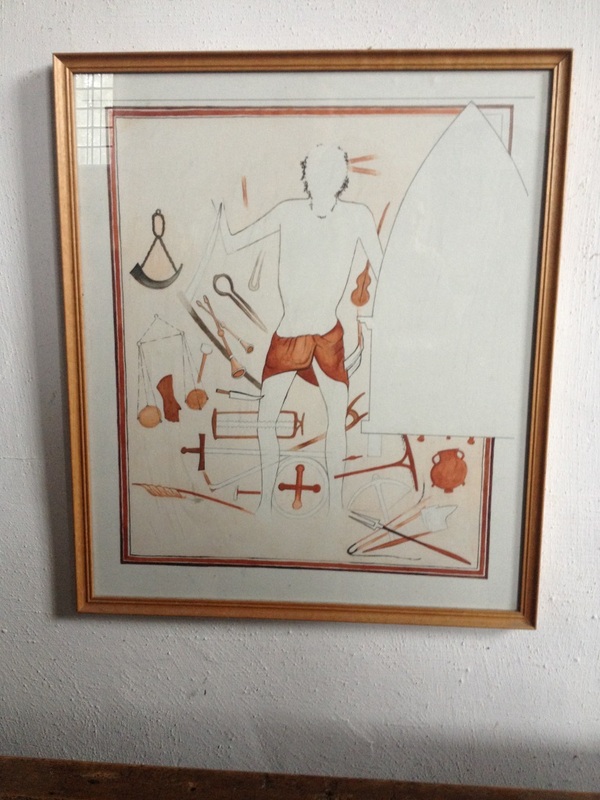 There were captions – ‘Ecce Homo’ above the Bound Christ, ‘Sancta Trinitas’ under the Trinity – but perhaps more significant was a series of prayers which could guide worshippers round the church. 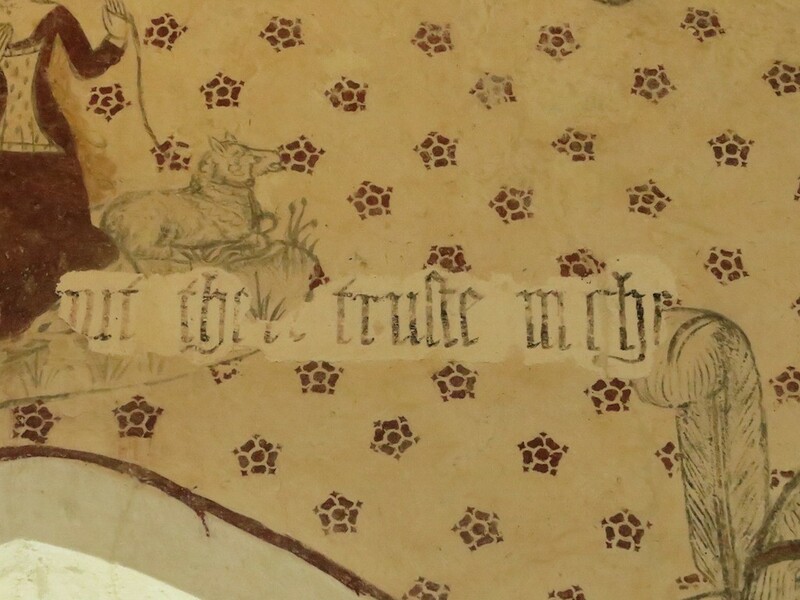 The Image of Pity had what looks like the famous late medieval prayer ‘Jesu mercy, Lady help’ (interesting that this one was in English) and a fragment of a litany, ‘A dent …’, possibly ‘A dentibus mortis’ or ‘A dentibus infernis’ … from the teeth of death, good Lord deliver us. 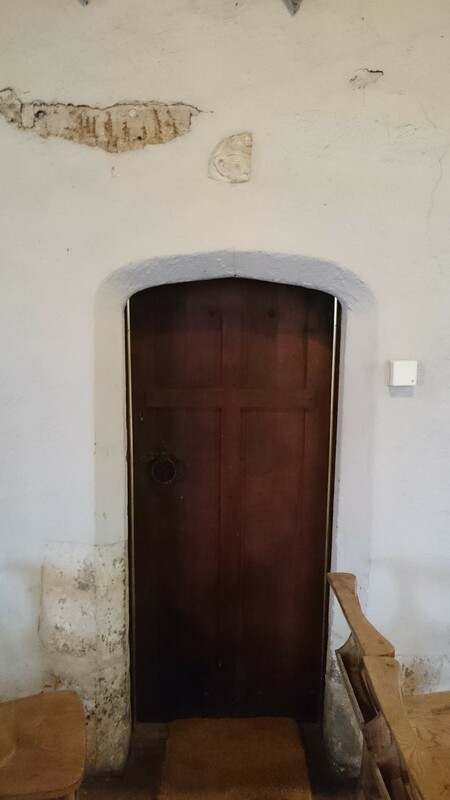 Under the north-west window was something we have interpreted as ‘Jesu Christe deus et homo da nobis pacem’ – ‘Jesus Christ, God and man, give us peace’. This sequence has now been fleshed out with quotations from familiar Bible passages and bits of the Easter services to accompany the paintings which tell the story of the Crucifixion. 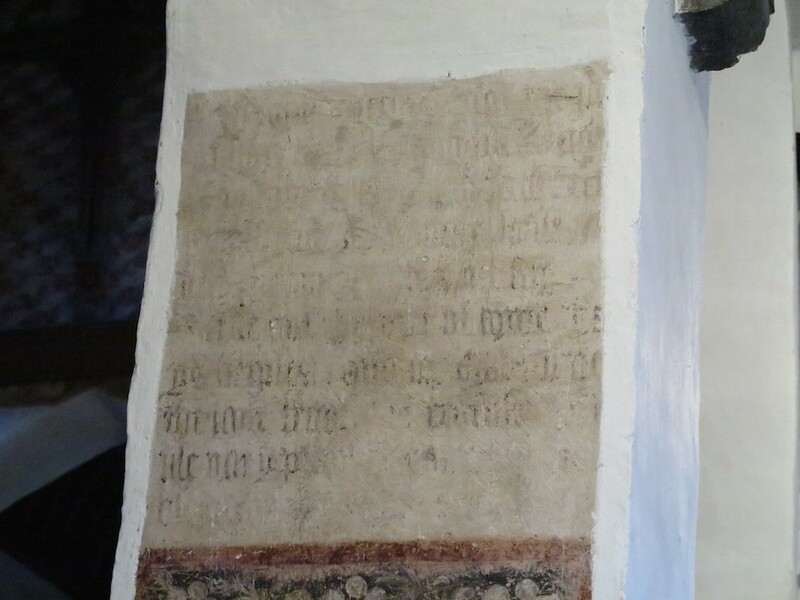 But why would a medieval congregation have spent time and money on painting texts on its church walls when hardly any of them could read? Of course, even if you couldn’t read, writing was Important – it told you that what you were looking at was significant. It could even have magic powers. Badges with fake writing on them, charms in strange garbled words on scraps of paper – these all suggest writing had power. But there is more to it than that. Some of the writing was probably recognizable, even if you couldn’t read it all. The A and M of Ave Maria, the J of Jesu Mercy: people learned to identify these and to respond to them. And the efforts they went to suggest that writing had meaning for them, even if they couldn’t ‘read’ it as we would use the word. They knew it could be read, it could be read to them, they could learn what it meant. We identify the pictures by their captions; they recognized the text from the pictures. Of course, all this is a huge challenge for the Museum to explain. 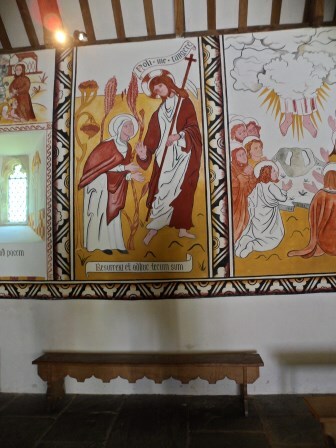 Few of their visitors will be familiar with the Latin liturgy, or even with the Bible stories on the walls. They do not want to over-interpret: it’s important that visitors experience the building for themselves. But how do you explain a medieval church to a modern audience? Why are they pouring water on that man’s head? Why are those men kissing? Why is that lady showing her breasts?